A cicada is an insect of the order Hemiptera, suborder Auchenorrhyncha, in the superfamily Cicadoidea, with big eyes wide apart on the head and usually transparent, well-veined wings. There are approximately 2,500 species of cicada around the globe, and many remain unclassified. Cicadas live in temperate to tropical climates where they are one of the most widely recognized of all insects, mainly due to their large size and remarkable (and often inescapable) acoustic talents. Cicadas are sometimes called "locusts", although they are unrelated to true locusts, which are a kind of grasshopper. Cicadas are related to leafhoppers and spittlebugs. Cicadas do not bite or sting, are benign to humans, and are not considered a pest. Many people around the world regularly complement their standard diet with cicadas: the female is prized for eating as it is meatier. Cicadas have been eaten (or are still eaten) in Ancient Greece, China, Malaya, Burma, Australia, North and South America and the Congo. Cicada are employed in the traditional medicines of China and Japan for hearing-related matters, poignant considering that they are known for the mating song the males of the species make. Cicadas are arranged into two families: Tettigarctidae and Cicadidae. 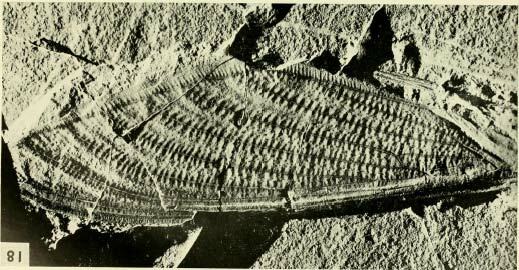 There are two extant species of Tettigarctidae, one in southern Australia, and the other in Tasmania. They occur on all continents except Antarctica. Adult cicadas, sometimes called imagines, are usually between 2 and 5 cm (1 to 2 inches) long. Although there are some tropical species that reach 15 cm (6 in). Cicadas have prominent eyes set wide apart on the sides of the head, short antennae protruding between or in front of the eyes, and membranous front wings. Desert cicadas are also one of the few insects known to cool themselves by sweating, while many other cicadas can raise their body temperatures voluntarily to around 40° C, even when the air temperature is only 18° C.
Only males produce the cicadas' distinctive sound. 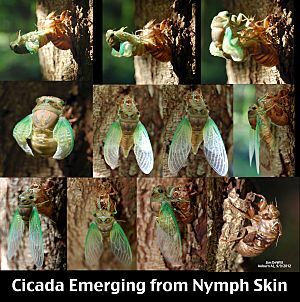 Both sexes, however, have tympana, which are membranous structures used to detect sounds; thus, the cicadas' equivalent of ears. Cicadae are unique in sound-producing insects in that they have a musical drum in their abdomen. The organs that produce sound are ‘tymbals' ~ paired membranes that are ribbed and located at the abdominal base. Contracting the internal tymbal muscles yield a pulse of sound as the tymbals buckle inwards. As these muscles relax, the tymbals return to their original position. The interior of the male abdomen is substantially hollow to amplify the resonance of the sound. The song intensity of the louder cicadas acts as an effective bird repellent. Males of many species tend to gather which net a greater sound intensity and engenders protection from avian predators. After mating, the female cuts slits into the bark of a twig and deposits her eggs there. She may do so repeatedly, until she has laid several hundred eggs. When the eggs hatch, the newborn nymphs drop to the ground, where they burrow and start another cycle. Most cicadas go through a life cycle that lasts from two to five years. Some species have much longer life cycles, e.g. the Magicicada goes through a 13- or even 17-year life cycle. The insects spend most of the time that they are underground as nymphs at depths ranging from about 30 cm (1 ft) up to 2.5 m (about 8½ ft). The nymphs feed on root juice and have strong front legs for digging. Around 220 cicada species have been identified in Australia. The Australian cicadas have been given fanciful common names such as: 'cherry nose', 'green grocer' and 'black prince'. Cicadas occur in almost every part of Australia: the hot wet tropical north; Tasmanian snowfields; Victorian beaches and sand dunes such as Torquay and deserts. 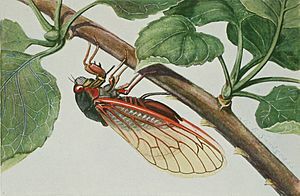 The plants cicada inhabit are both exotic and native including tall trees, coastal mangroves, suburban lawns and desert shrubbery. Cicadas are principally tropical insects and most Australian species are found in the northern states. The great variety of flora and climatic variation found in north-eastern Queensland results in it being the richest region for the spread of different species. The area of greatest species diversity is a 100 km wide region centered around Cairns. The Australian 'green grocer', Cyclochila australasiae is amongst the loudest insects in the world. According to Max Moulds of the Australian Museum in Sydney: "the 'green grocer' is unusual in its ability to adapt perfectly to the urbanized environment." Cicada sounds are a defining quality of Melbourne and Sydney. Cicada camouflaged on an olive tree. Kassiopi, Corfu, Greece. Silver casket with writing utensils, made by the Nuremberg goldsmith Wenzel Jamnitzer (1507/08–1585). Silver cicada is at lower left. Cicada Facts for Kids. Kiddle Encyclopedia.